Anyone with even a passing interest in food knows the importance of texture. We might use the term ‘taste’ as a general description, but we’re not just talking about the flavour of a dish; food is measured in structure, in substance, in ‘mouthfeel’. And as their skills improve, home cooks and chefs alike begin to strive for perfection in texture; I’m not talking the foams and jellies of molecular gastronomy here, but recgonisable goals – the crispiest bacon, the fluffiest scones, the lightest of soufflés. Texture is often a question of technique; having been baking my own bread for nearly a year I can vouch for the difference a good kneading technique and aeration of the dough can make to producing a lovely light loaf and crispy crust. And having owned an ice cream maker since the summer, I can also see the difference in my homemade ice creams; the mechanical churner resulting in an ice that is infinitely smoother, creamier and more uniform in its lack of crystals. As well as technique, texture can also be developed through the addition of individual ingredients. Adding cream to pavlova creates contrast with the crispy, chewy meringue, while the topping on crumble provides a crumbly, crunchy foil for the soft stewed fruit below, each individual attribute highlighted by contrasting tastes and textures on your tongue. 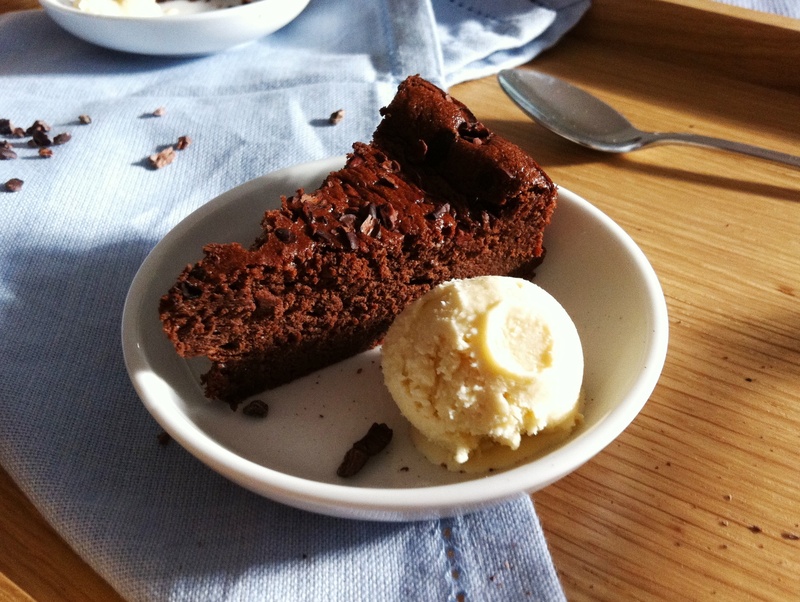 The recipe below takes two ingredients and uses them to add interest and contrast to the simple, winning combination of chocolate cake and ice cream. Cacao nibs – roasted, hulled pieces of cocoa bean with a bitter, nutty taste – are sprinkled over a dense, mousse-like cake, adding a satisfying crunch to the smoothness of each bite (the nibs don’t melt when baked). 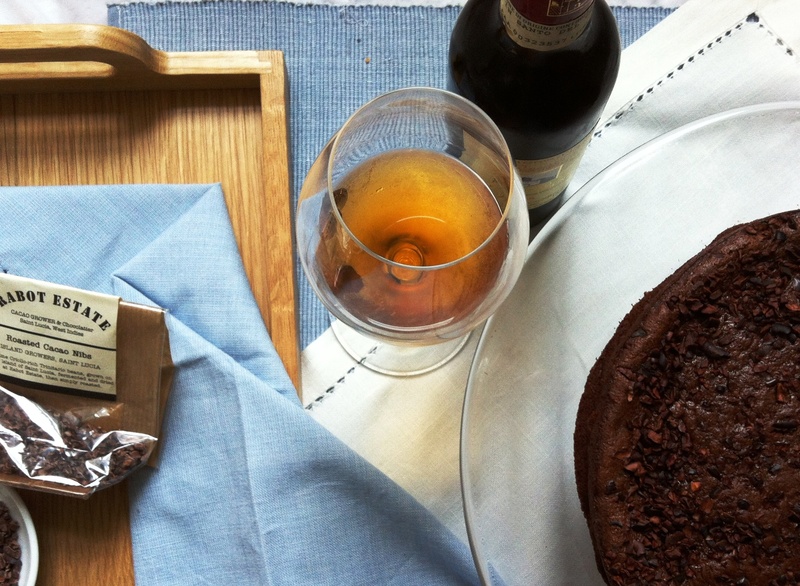 The cake is then served with a boozy vin santo ice cream, its texture made softer and more luxurious by the addition of alcohol which lowers the freezing temperature and allows you to scoop it straight from the freezer. This isn’t just an experiment in texture though – the flavours also pack a punch. A shot of espresso in the cake lifts the chocolatiness to new levels (if you don’t like coffee, don’t worry – often when coffee is added to chocolate it simply enhances the taste rather than adding any real flavour of its own), while the honey and raisin notes in the amber-coloured vin santo add a satisfying sweetness to what is otherwise an elegant and very grown-up pudding. As an aside, the recipe for this cake was discovered by acclaimed pastry chef David Lebovitz in the cubicle of the men’s toilet at Racines restaurant in Paris. No, he didn’t have an epiphany whilst going about his business – he actually read and made a note of the recipe which was scribbled across the cubicle wall. You can read the full story here, but it just goes to show you should always keep an open mind; sometimes you can find the greatest things in the most unexpected of places. Have you ever tasted a dish that you just had to have the recipe for? And to what lengths would you go to procure it? Preheat the oven to 175° C. Grease a 23-cm spring-form cake pan and line the bottom with baking parchment. Melt the chocolate, butter and espresso in a large, heatproof bowl set over a small saucepan of simmering water. When you have a smooth, glossy mixture, remove the bowl from the heat, stir in the vanilla and set aside. In a clean bowl, whisk together the egg yolks and 50g of the granulated sugar until light and creamy, about 1 minute. In a separate bowl, whisk the egg whites on low speed until they begin to hold their shape. Add the rest of the granulated sugar (30 g) and continue to whisk, moving up to high speed until the whites hold soft peaks. Fold the beaten egg yolks into the cooled chocolate mixture, then fold in half of the whipped egg whites. Fold in the remaining whites until there are no visible streaks, taking care not to overfold or knock out the air in the mixture. Pour the batter into your prepared tin, sprinkle with cocoa nibs, and bake for around 25 minutes, until the cake is set but still slightly wobbly in the middle. Remove from the oven and allow to cool completely on a wire rack. When ready to serve, release the sides of the pan, remove the baking parchment from the bottom and place on a serving plate or cake stand. Serve with vin santo ice cream, below. Heat the double cream in a medium saucepan with 50ml of the vin santo until warmed through. Remove from the heat and pour over the egg and sugar mixture, whisking continuously until combined. Return the pan to a medium heat and cook your custard until it coats the back of a spoon. Remove from the heat and stir in the remaining 130ml vin santo. Strain into a large mixing bowl set over an ice bath and whisk until cooled. Chill thoroughly in the fridge before churning in your ice cream maker. Because of the high alcohol content, this ice cream should be nice and soft served straight from the freezer. Best enjoyed with a slice of chocolate cacao nib cake (above), or served in scoops with cantuccini biscuits crumbled over the top. scrummity 🙂 I love the story behind this recipe! Beautiful idea and I love the photos. It just makes me pine for the days when I used to make homemade ice cream at least once a week (when I actually had friends coming over to eat it, instead of parents who scorn my weird and wonderful flavour combinations!) Where can you buy cacao nibs? I used to love this stuff called NibChoc that I found in Oxford, which is basically like a ‘healthy’ chocolate bar with cacao nibs, and so the idea of putting the nibs in a cake really makes me want to try it! What a wonderful use this would be for the cocao nibs I have at home! The cake looks delicious and the ice cream sounds like the perfect accompaniment. As a big David Lebovitz fan myself, I must say his recipes are unbelievably good. I would love to try some of his ice creams out, but need to get myself an ice cream maker first. How is yours….was it a good buy??! Gosh that looks good – I love a bit of crunch and some ice cream on the side never hurts! I bought a bag of cocoa nibs a while back and was wondering how to use them…you have shown me the way! Cake looks delicious. I know the cacao nibs are the icing on the cake here (literally! ), but I’m hoping it would taste almost as good without them, since I have no idea where I would buy them here in Dublin. If this cake is good enough for David Lebovitz…….! Your posts always make me drool! Another one to bookmark. Looks absolutely stunning, thanks! Tandy – it made me laugh when I read it. Shows you should always have a pen to hand! Elly – thank you. I was trying (and probably failing) to channel some of Helen du Jardin’s food styling techniques…am currently reading her book Pixel to Plate. I bought my cacao nibs in the chocolate shop in Borough Market…think it’s owned by Hotel Chocolat. Kathryn – they’re such a great addition as they don’t melt so add a bitter, chocolaty crunch to the cake. Lorraine – no, me neither. Will be looking more closely in future though! Laura – thank you. Mt ice cream maker is a Cuisinart Duo – you have to freeze the bowls first so I always keep on in the freezer. Great if you want to make two different flavours at once! The Caked Crusader – I think vin santo is my new favourite ice cream flavour – sweet, creamy, honeyed and delicious! Claire – you can buy them online but yes, the cake would still be lovely without the nibs. Lauren – so would I! Sadly it all got eaten the day I made it…will have to make again soon! Oh my! This looks absolutely divine! Lovely clicks too! 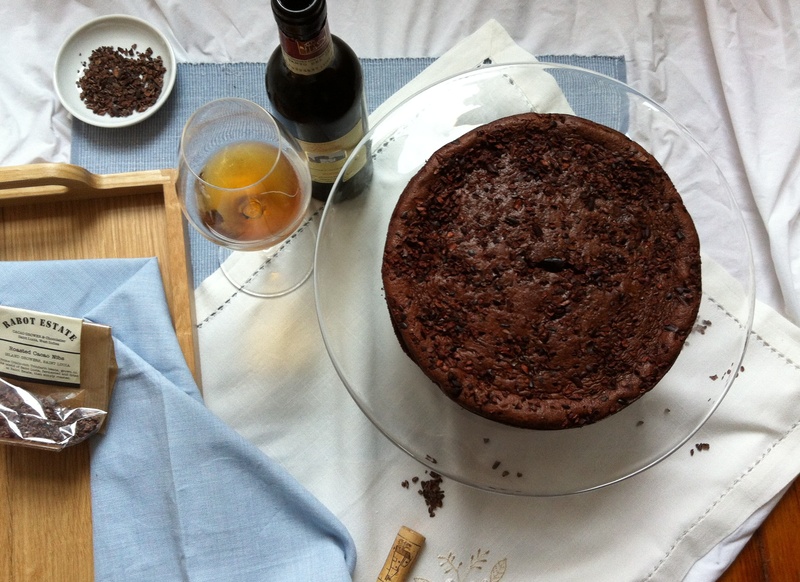 That vin santo ice cream is just brilliant paired with the chocolate cake. Perfect way to end a meal! Ahh I remember seeing this in David Lebovitz’s cookbook when I checked it out in the summer. I wanted to try it out but never got around to it. Glad to hear it turned out well. isn’t it amazing how a few ingredients can make all the difference in the outcome of the cake, it’s taste and texture? a great recipe and read, littleloaf! Nic – definitely! I’ve not made anything else with them yet but want to try. Sylvie – although I’m a sucker for chocolate and anything with bits in, I think vin santo is one of my favourite ever flavours – so luscious and rich. Amy – aw, thank you. I love trying different flavour combinations and these two desserts work so well together, I had to share! Jennifer – thank you. If I can ever bake cakes as beautiful as yours I will be a happy little loaf! gosh the two recipes put together are just plain temptation.the cake esp, it looks so dense and rich, just the kind I like. I have this aversion towards songe cake, and not even chocolate can make it better. this looks so good, and great photos btw!! This is an awesome recipe. Chocolate is my absolute favourite flavour on earth, and the double chocolate effect from the nibs, the chocolate cake matched with ice cream is just heavenly. YUM! I don’t think I have ever tried cacao nib, but the cake looks rather delicious! I love your photography, all the photos look great. Yum your cake sounds amazing!!! I adore anything chocolate. I’ve been wanting to try cacao nibs in my baking for a while but haven’t gotten around to it. Shu Han – thank you. 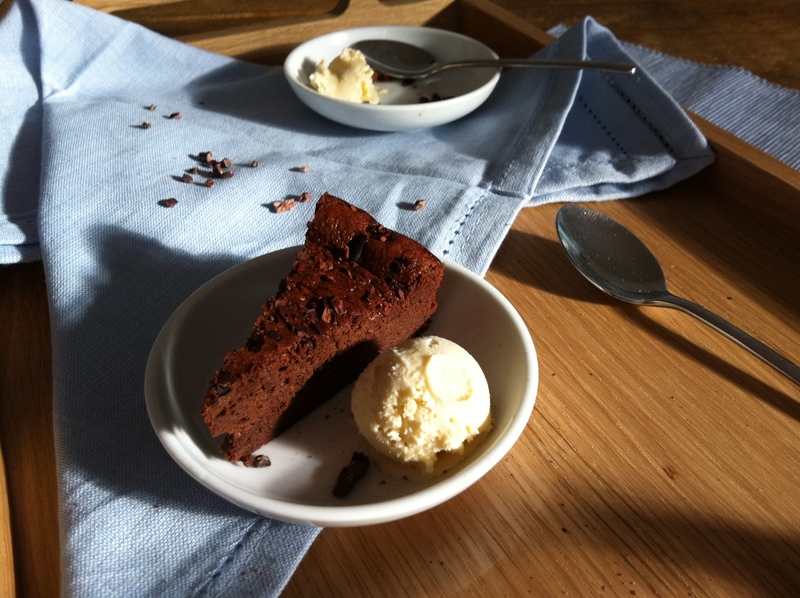 Chocolate sponge just isn’t the same as a denser, fudgier flourless one – I know what you mean! Jennifer – they’re definitely worth trying and add a really interesting crunch to the cake. As a non coffee lover, I was quite surprised to find that a bit of coffee does indeed enhance the flavour of a chocolate cake – not too much though! Have you also been taking influence from his photography? Do I see a little more styling than usual?! Gorgeous, as always. You take desserts to dizzy new levels…amazing. I have some cacao nibs on hand, Must try this amazing story of food texture…love it, I do!! Coffee and chocolate – always winners! Choclette – thank you 🙂 and yep, it’s weird, often coffee brings out the chocolaty flavour without actually tasting of coffee. I have made flourless chocolate cakes several times in the past but not for a few years and I have never used cacao nibs and was intrigued. Wow! What a great addition. Truly delicious. I am afraid I didn’t make the ice cream or have the vin santo but a dollop of crème fraîche was a good alternative, with the cool creaminess contrasting with the rich chocolate and crunchy nutty nibs. Maybe I will go ‘full monty’ next time! Thank you for the great recipe and for introducing me to cacao nibs which will now find themselves working their way into other creations as ideas are whizzing around in my head! Amy – ooh so glad you liked it. The crunchy cacao nibs are so nice against the rich, smooth cake aren’t they? I love it with a simple dollop of creme fraiche too – it’s the perfect match. 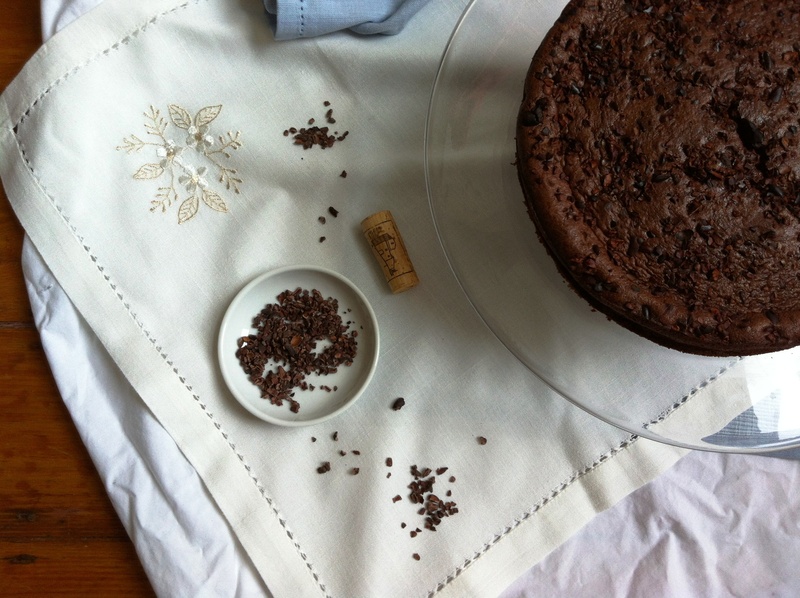 I definitely want to do more baking with cacao nibs too – they’re lovely in meringue too. Just thought I’d let you know that I made some cacao nib biscuits today and they were a delicious success! Adapted from Tartelette, using plain flour and adding some vanilla extract. Recommended! Ooh thanks for letting me know. I love Tartelette’s recipes so I’m sure they were absolutely delicious…must try sometime!